Our menu is headlined by 5 core pizzas which we offer at every market. We also offer 1 to 2 specials which change frequently and are completely dependent on the fresh produce that’s in season. You can also choose to build your own pizza by selecting from our list of toppings. No matter what you choose, you’re guaranteed a great pizza topped with ingredients either made by us or sourced from producers we trust. Find out what markets to find us at, or hire us for private catering. We start with our rich Sicilian sauce and then we don’t hold back with the cheese: fresh and block mozzarella, cheddar and parmesan create an irresistible combination that highlights the perfection in simplicity. Why always look to other countries for cured meat when Cork’s own Gubbeen Smokehouse Chorizo tastes so good? Fresh mozzarella, cheddar and our Sicilian sauce are all that’s needed to round out this meat-lover’s pizza. We love Woodside Farm both for their incredible ham and commitment to ethically rearing their pigs. For ham this good, only fresh, juicy pineapple will do. The mozzarella, cheddar and our Sicilian sauce which accompany make for one satisfying pizza. 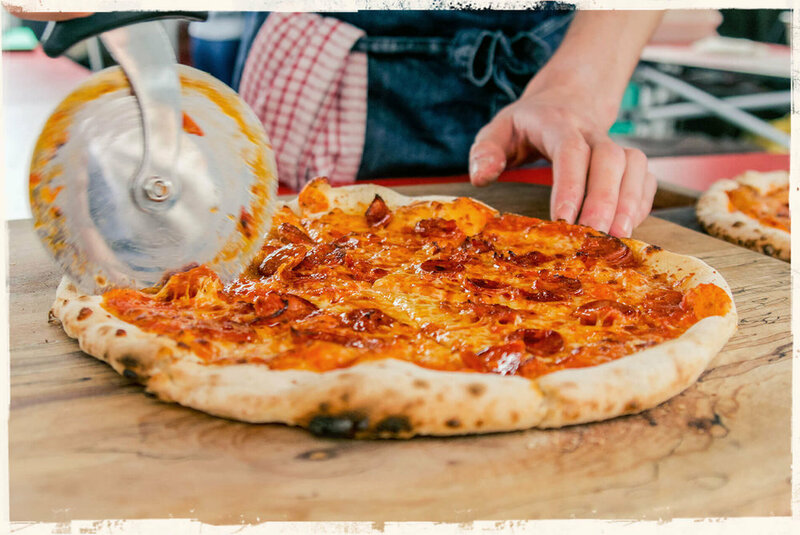 We’re ones to honour tradition, and that’s why we believe the fine quality of traditionally made Iberico chorizo belongs on our pizza. Not to mention that it goes so well with our housemade pickled jalapeños, sweet, spicy and tangy flavours taken over the top by dollops of rich and creamy creme fraiche. Simplicity at its best. Cheddar, fresh tomato and our Sicilian sauce. What else do you need? If you’ve tasted the jalapeños on our Iberico chorizo pizza and dreamed of having a jar of them all to yourself, your dream is about to come true. We pickle the jalapeños in our own brine to turn them into sweet, zingy, spicy, tangy flavour sensations that complement so many different foods. You’ll find the jars for sale in our market stalls. Two balls of dough and enough tomato sauce to cover them are just what you need to have a freshly-cooked pizza dinner in your own home, and that’s just what our pizza kits provide. You get the fun of stretching the dough and topping the pizza as you like, and the pleasure of having a fantastic dinner on the table in no time at all. Our pizza kits are available to purchase from our market stalls. We have a presence at a lot of local farmers markets, see here for a full list of places and times - or we also cater private events if you would like to make an enquiry.